This is the second in a series about how my local libraries (Baillieston and Shettleston) afforded me a wonderful musical adventure and the huge impact they made on me. I joined them as a 16 year old because I couldn’t afford albums and borrowing from them appeared to me to be the perfect solution…which it most certainly was. In my 5th year at high school one of the novels my English teacher selected was The Fall by Albert Camus. This was the only reason I picked up a copy of Dragnet, which had been released a few months earlier. Everything about the album was challenging but also exhilarating and liberating and, like me I’m sure it lead others to form their own groups free from restrictive ideas about song structure and musicianship. Hey you horror-face!” and Dice Man that won me over to the bands radical approach. Of all The Fall albums I’ve listened to, over time this is my favourite. 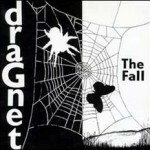 It’s rough and I found out later that it was recorded in 3 or 4 days, but for me it demonstrates the essence of The Fall, raucous and uncompromising determined to mine their own musical path. My excitement about the album lead me to see the band at the Tech when they came to Glasgow in tow with another great band The Cramps which is one of the best gigs I’ve ever been to. The next time I saw the band was at The Plaza in Glasgow, this time supported by brilliant Edinburgh band The Scars. By this time I was well and truly one of The Fallen!